Our family of five just got back from a week in the Pacific Northwest and it might have been my favorite vacation ever! Our kids are 9, 7, and 3 and they were the perfect ages! We also went in July and had sunny skies every day we were there except for one cloudy day (but no rain!). When we were in Washington, one of the locals told us that there is no poison ivy, poison oak, poisonous snakes, or ticks in the Washington forests…how much better can you get?!?! Below I have shared some of the highlights from our week in the Pacific Northwest with kids. Our trip was AMAZING but there were a few things I would do differently, which I note at the bottom. There was so much to see and do…we couldn’t get everything in! Also, I planned this trip solely for the pleasure of our own family and decided to share because our family had such an amazing time. I was in no way reimbursed or given any type of incentive to mention any place or hotel. It took us most of the day to get there thanks to a loooong layover in Phoenix. We stayed overnight in the Embassy Suites by the airport. Here is a shot of Mt. St. Helens from the air as we were flying into Portland. Multnomah Falls was about a 30 minute drive east of Portland from our hotel. I would suggest getting there as early as possible because it gets SUPER packed, especially in the summer. I believe the falls themselves are always “open” but the visitor’s center doesn’t open until 9am. We got there right at 9 and by the time we made our way back to the car…you had to push yourself through the bridge there were so many people there. My adventurous kiddo and I hiked up to switchback 3 (out of 11!) but the hike gets steep and there aren’t any railings on the side after the big bridge, so my husband and two other kiddos opted not to go. After we saw Multnomah Falls, we started our trek westward to Cannon Beach. We spontaneously decided to take a quick detour to the Tillamook Cheese Factory where we ate lunch (they had the BEST macaroni and cheese…it was so good). You can tour the actual factory but we skipped that in lieu of getting to Cannon Beach earlier. The drive up 101 from Tillamook to Cannon Beach was really pretty! This photo was taken at a scenic point off the highway. We got to Cannon Beach and checked into the Surfsand Resort. It was an amazing place for kids and I can’t recommend it highly enough! They have complimentary bonfires with s’mores on the beach each night (in the summer), bikes you can borrow for free to ride on the beach, DVDs and popcorn delivered to your room, and special little gifts for the kids each night on the bed (one night was lei necklaces and the next it was spongy starfish). The view from the beachfront rooms is spectacular and Haystack Rock can be seen to the south of the hotel. Our room was on the very edge of the building with another building jutting out, so we could only see the tip of Haystack rock but the ocean view was worth it (and we payed a little less since we couldn’t see Haystack). At low tide there are tons of tide pools around Haystack Rock that we enjoyed exploring. We saw so many starfish (sea stars) and tons of tiny sand crabs. There are also many birds that live on Haystack Rock that are fun to watch. At low tide in the summer, they have volunteers come out and set up a truck where you can learn more about the tide pools and the creatures who call Haystack Rock their home. If you get a chance, drive up to Ecola State Park. It is $5 to get in the park itself, but the drive to the park entrance is worth it! Not only do you get a bit of a rainforest drive, you also get a gorgeous view of Cannon Beach! You can also borrow bikes from the hotel to ride on the beach or rent some low-riding books at low tide as well. Our kids also enjoyed flying kites at sunset! Yummy Places to eat: The Wayfarer (kids eat free if you stay at Surfsand) and Mo’s. We spent a couple hours soaking up Cannon Beach before heading out for our next destination. We drove up 101 through Astoria (be sure to stop in this adorable town where The Goonies and Kindergarten Cop were filmed). It took us a little over 3 hours to drive to Quinault, Washington in the Olympic National Forest. We stayed the night the Lake Quinault Lodge and it was beautiful in a rugged, historical way. The amenities in the hotel rooms themselves are pretty average (we stayed in one of the buildings to the side not in the original lodge itself) but the view of the lake is amazing and the grounds are gorgeous. The kids can swim in the lake or play in the large backyard behind the Lodge and you can rent kayaks as well. Franklin Roosevelt stayed at the Lodge and ate in the restaurant shortly after it opened in the 1920’s, so it is filled with all sorts of historical charm. 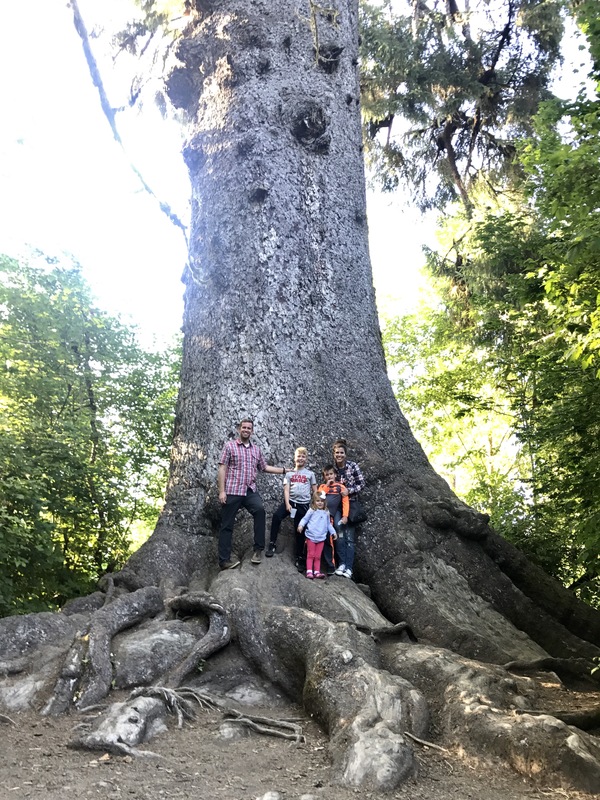 About a mile away from the Lodge, you will find the World’s Largest Sitka Spruce Tree that is said to be over 1,000 years old! It is about a 5 minute walk from the road and so cool! This might have been my favorite day of the whole trip because of the diversity of landscapes we saw within just a few short hours…we went from a beautiful lake to an otherworldly beach to a rainforest and past snow-capped mountains all in a day! It was a truly memorable drive! We started our day with a delicious breakfast at Lake Quinault Lodge before getting back on Highway 101. About 30 miles from the Lodge you will find signs for Beach 1, then Beach 2, Beach 3, and Beach 4. Be sure to stop at Beach 3…you will take a short hike downward through a rainforest before you enter a most beautiful black-sand beach. Try to get there at low tide for the best exploring (you can find the tide calendar here). Several miles down 101 you will see Ruby Beach…this is the most popular beach with tourists and reminds me a lot of Cannon Beach with the rock formations in the water. It is beautiful but I still think Beach 3 is the best especially if you have already been to Cannon Beach (and you will feel like it is all your own as not many people stop there). After Beach 3, we took the turnoff to the Hoh Rainforest (about an hour from Beach 3). The drive was beautiful as it follows the gorgeous Hoh river (with crystal blue water) to the entrance of the park. We walked the Hall of Mosses (about a mile hike) with the kids and they all did great! We felt like we were on the planet of Endor in Star Wars and kept waiting for an ewok to pop out! We got back on the road making our way around the Olympic Peninsula. We drove through Forks, home to the Twilight series. We wanted to drive to Cape Flattery (the northernmost point of the contiguous United States) but there just wasn’t enough time. After Forks, we started getting into mountainous territory and drove along Lake Crescent. It was a gorgeous drive! Two hours after getting in the car from Hoh, we arrived at the Hurricane Ridge Visitor’s Center in Port Angeles. We found out it would be another 45 minutes (one way) to the top of Hurricane Ridge (where you get to see a gorgeous view of the snow-capped Olympic Mountains). By this point our kids were done being in the car, so we decided to just skip Hurricane Ridge (much to my own sadness) and head to our hotel in Sequim. Sequim (pronounced “Squim”) is about 20 minutes east of Port Angeles and is such a cute town. If you go in late July, you will find the lavender farms in full bloom! We stayed in the Holiday Inn Express in Sequim for the night and it was the nicest Holiday Inn I have ever stayed in! We grabbed a pizza to go and went down to the Dungeness National Wildlife Refuge. It costs a few bucks to get it (free with your “Every Kid in a Park” pass) and was about a half-mile walk down to the ocean. It was such a rugged ocean view, totally different than the other ocean stops we made on the trip. You can also see the lighthouse which is just off the tiny peninsula that juts out with a beautiful view of Mt. Hood just behind it. And to the north you will see Canada. We left Sequim after breakfast and drove about an hour and a half to catch the Bremerton ferry, which lasted another hour until we arrived in downtown Seattle. This was the only day that it wasn’t sunny and the ferry was pretty chilly. Once we pulled off the ferry, we drove a few blocks away to find a place to park to go to Pike Place. In all honesty, staying in Seattle was my least favorite part of the trip. I didn’t realize how much I preferred nature over cities until this trip. 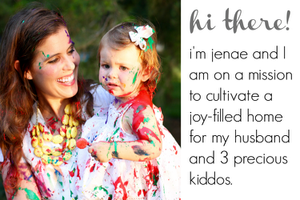 If my husband and I were alone, it might have been different…but with the kids in tow, the city was stressful. We stayed our last two nights in the Pacific Northwest in a 2-bedroom Airbnb in downtown Seattle. It was nice (although the kitchen smelled kind of funny and one of the TV’s didn’t work), but for the same price (or maybe less) you could stay in the Homewood Suites just a few doors down (which is what we would have done but they were sold out for the nights we needed). We went to the Space Needle in the afternoon (it is pricey but the view is pretty amazing) and then we ate some sushi downtown at Blue C Sushi with a legit sushi conveyor belt…the kids thought it was so cool! This was our laziest day of the vacation. We all slept in…the kids played the Playstation in the Airbnb, and I read several chapters of my book. I think everyone just needed to veg for a bit after going nonstop for 6 days. We hopped on the monorail and went down to Seattle Center to see the International Fountain (totally free and my kids’ favorite part of Seattle). You will also find a Children’s Museum, Museum of Pop Culture (the exterior of the building itself is worth admiring) and the Science Museum all right there (although we didn’t do any of these ourselves). Right in front of the Museum of Pop Culture is the Art Park – it is a pretty awesome (and futuristic) play structure for kids. All three of my kids had a blast! Oh, and if you want to get a great view of the city line at Mt. Rainier on a clear day, head to Kerry park. There is only one part of our trip that I would have changed and that is the amount of time we spent in Seattle…I could have easily just stayed there half a day instead of the 2 days we ended up staying. We had planned on taking a day trip to Mt. Rainier National Park on one of those days, not realizing it was a 2.5 hour trip (one way) from where we were staying in Seattle. We just decided that wasn’t feasible for our kids who would be on a plane most of the following day. And since we had already booked our Airbnb, I couldn’t cancel it to stay somewhere closer to Mt. Rainier. In hindsight, I would spend only half a day in Seattle (seeing Pike Place Market, the Space Needle, and the International Fountain) and then I would either spend the remaining time at Mt. Rainier or Mt. St. Helens, which we didn’t get to see! What is your favorite place in the Pacific Northwest? Share with us in the comments! Hi! Im from the Pac NW, and I love all the places you went. I just wanted to tell you that the ferry you took was the Bremerton Ferry. If you ever come back over here, check out Astoria Oregon – you can see the Columbia River join the ocean. Long Beach, WA is beautiful as well and it’s a bit warmer because it’s further south. Thank you! I made the change to the ferry name. 🙂 We drove through Astoria and we would have loved to have spent more time there but we quickly realized 1 week was not long enough for everything we wanted to do! I also live in the PNW, I took my kids to the science center and children’s museum located by the space needle. I’m sorry you didn’t know about those places. It’s the only thing I do in Seattle with the exception of taking a ride in the ferriswheel on the waterfront. Beautiful and you can see all around. The other thing is in Astoria there is a Lewis and Clark park. They rebuilt a replica of the place they stayed when they reached the waters edge. It was fun to walk through as they have the beds, furs etc of those explores and you get a good feel for how they spent the wet winter. Glad you enjoyed your vacation and the PNW. We looked into both the Science Museum and the Children’s Museum and decided against them as we have something very similar at home. I was hoping we could have spent more time in Astoria but we quickly realized 1 week was not enough for all we wanted to do there! So glad i found this post. I am from England and am currently planning a 2 week trip to PNW in May this year. I was really wanting to do Portland up to Vancouver, do you think this feasible? It will be myself, husband and 4 year old son whos very well travelled and used to long car journeys. In was debating hiring a car or and RV, maybe the RV give a bit more freedom to be able to do more or less driving depending on what we find. Cannon beach looks amazing, we are all more country rather than city family too and all the forests and mountains amdnbeaches just look like heaven to me. Yes, I definitely think Vancouver is feasible especially if you forego spending too much time in Seattle. Vancouver is only a 2 hour drive from Seattle. I hope you have a magical trip!! !